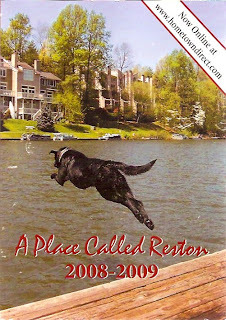 The Place Called Reston phone book showed up at Restonian World Headquarters the other day, and this photo on the cover shows yet another benefit of living in the "city of trees": The roving packs of feral dogs ready to dive into the water at an instant's notice in hopes of finding a submersed Snosage. The dog is leaping after a thrown swatch book. The dog's owner is obviously training the dog to react to non-approved colors, so that non-mauves may be rooted out and destroyed.